What better way to start the holiday season than with a Round Prong Set Eternity Band, in 14k yellow gold, valued at $595! 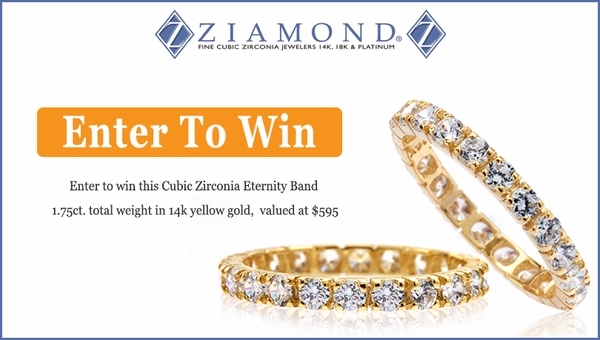 For the month of November, Ziamond is giving away a FREE round prong set eternity band to one lucky winner! Set in solid 14k yellow gold, this eternity band perfectly displays our round simulated diamonds in individually hand set a four prong mountings. This fully encrusted wedding band includes approximately 1.75 carats in total carat weight of Ziamond’s spectacular hand cut and hand polished Russian formula cubic zirconia. Each brilliant and sparkly stone in this ring weighs about .10 carat each with 58 sparkling facets and measuring approximately 2.75mm in width. This makes for a great stand alone band, a stackable band and a complimenting band to your solitaire. Ziamond offers so many versions of the eternity band, like this one which is individually set in four prongs each, we also offer shared prong eternity bands, channel set eternity bands, bezel set eternity bands and more. Choose from 14k white gold, 14k yellow gold, 14k rose gold, 18k white gold, 18k yellow gold and luxurious platinum. Entries for this sweepstakes can be made via social sites like Twitter, Facebook and Pinterest. Additionally, you can enter directly on the Ziamond.com website. Entering the contest will automatically add you to the Ziamond V.I.P. mailing list so you can stay up to date on all specials and events at Zamond.com, you can also unsubscribe at anytime. Good luck and share the sweepstakes with loved ones and friends, so they too can have a chance at winning some bling! NO PURCHASE NECESSARY TO ENTER OR WIN THIS SWEEPSTAKES. Sweepstakes is open to legal residents of the 50 United States and the District of Columbia, age 18 and older and who have a valid email address at time of entry. Void where prohibited. Online entries must be received between 12am Eastern Time on 11/3/16 and 11:59pm (“PT”) 11/3/16. Winner will be selected no later than December 9, 2016 and notification will be sent by email. This entry was posted in cubic zirconia, cz, Diamonds, Eternity Bands, Gold, holiday gift ideas, Platinum, Rose Gold, sweepstakes, Uncategorized, Wedding Rings and tagged 14k gold, 18k gold, cubic zirconia, Diamonds, eternity band, platinum, rings, rose gold, stackable, sweepstakes, vip email program, wedding band, ziamond on November 10, 2016 by Victoria Foster.